André Grimaldi, a former chief of Diabetology at Pitié-Salpêtrière Hospital, Paris, is known for his initiatives as a whistle-blower. In 2013, he was responsible for launching a petition demanding a public debate on health issues in France, which was signed by more than 2,000 well-known medical and political figures. He is the author of Manifeste pour une santé égalitaire et solidaire (Editions Odile Jacob, 2011). Contributors: Professors J.P. Lépine, B. Dautzenberg, J. Ankiri, E. Bruckert, J. Blacher, B. Bégaud, A. Gompel, E. Pujade-Lauraine, A. Gaudric, I. Mahé, T. Similowski, J.P. Collet, F. Trémolières, P. Ruszniewski, S. Gilberg, A. Basdevant, M.C. De Vernejoul. This book offers a complete, well-documented inventory of medications, from migraine treatments to antidepressants, from vaccines and antibiotics to anti-smoking aids. Information on each item has been validated by a physician who is an expert in the corresponding area. These specialists reveal the truth about each medication — a truth the pharmaceutical industry and public health services have kept secret. The authors have carefully crosschecked medical assessments and opinions concerning the efficacy of each drug, without oversimplifying and without dodging discussion. The authors explain how medications are put on the market, how they are priced and how the percentage to be absorbed by health insurance is determined. They also examine such issues as side effects, the status of homeopathy and self-medication, and the role of generics. They examine, with lucidity and moderation, the lessons we should learn from pharmaceutical industry scandals and from the frequent collusion between Big Pharma and political officials. 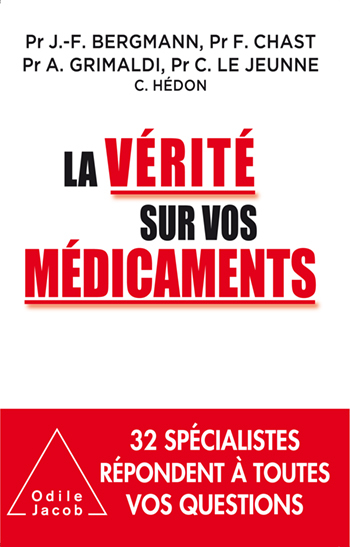 • Precise analyses for each medication, validated by specialists in the corresponding sector. • From marketing to side effects and the workings of the pharmaceutical industry, this book tackles a wide range of vital issues.